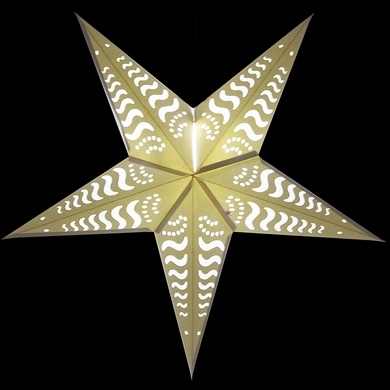 24" Solid White Tidal Waves Cut-Out Paper Star Lantern, Hanging Decoration On Sale Now from AsianImportStore. AsianImportStore's hand-crafted hanging Paper Star Lanterns are beautiful as a home decor accessory or as an outdoor Wedding decoration. These star lantern lamps are high-quality - made from thick paper and punched with a special wave design. Available in many colors and patterns, our unique star lanterns have been seen hung on walls and ceilings in shows like MTV's unplugged concert series and Fox's Empire TV drama. Makes a beautiful display or decoration in any room in the home. Adds a fun touch to any party or event. Pair with one of our Wedding decoration. These star lantern lamps are high-quality - made from thick paper and punched with a special star design. Makes a beautiful display or decoration in any room in the home when paired with one of our lamp cord kits.